Draft: 2011, Cleveland Indians, 16th rd. Full name RYAN ADAM MERRITT...Married, Sarah...Graduated from Celina High School in 2010 (played football and baseball) before attending McLennan Community College (Waco, TX) in 2011, where he was an All-American…Favorite player growing up was Nolan Ryan (favorite team was the Texas Rangers)...Enjoys hunting and fishing in the off-season...2018 Tribe Fest participant. Spent most of the season in Columbus, posting a mark of 10-5 with a 3.03 ERA in 19 games/18 starts (CG, 116.0IP, 116H, 39ER, 25BB, 85SO) and went 2-0 in 4 starts with Cleveland over six stints (Indians were 3-1 in his starts)...His 3.03 ERA was the 6th-lowest mark in the International League and his 10 wins were tied for 7th...Also made a spot start on June 12 for Lake County (7.0IP, 7H, 2R/ER) to stay in line for a spot start with Cleveland as his 11 combined wins on the year were 3rd-most in the organization and his combined 3.00 ERA was 3rd-lowest…Over his last 7 starts at AAA (6/24-8/12) he was 4-0 with a 1.45 ERA (43.1IP, 34H, 7ER, 3BB, 29SO) and won his last 7 decisions...Batters hit .234 (37/158) with runners on against him and .188 (16/85) with RISP...Went at least 5.0IP in all but 2 of his starts and struck out 10 batters in a season-high 8.0IP on June 24 vs. Toledo (3H, 1R, 0BB)…Excelled in a spot start role over his six stints in Cleveland, serving as the "26th man" in three doubleheaders (June 17, July 1, August 17)...Over his last 2 starts (8/25 vs. KC; 8/30 @NYY-G2) he was 2-0 with a 0.75 ERA (12.0IP, 12H, 1R/ER, 3BB, 4K)...His first two starts of the season came in doubleheaders at Minnesota on June 17 (3R/2ER, 4.0IP) and August 17 (2R/1ER, 3.2IP), both no-decisions...Was also with Cleveland, July 17-21, August 25 and again from August 30-end of the season...His 6.2 innings on August 25 vs. KC were a career-high for a single game...Appeared in relief on July 21 vs. Toronto, where he worked a scoreless 9th inning...Was with the club from August 30th-on but did not appear in a game after the 2nd game of the doubleheader at New York…With Cleveland, right-handed batters hit .258 (16-62, .589 OPS) and lefties hit .455 (10-22, 1.045 OPS, 0 walks)...Walked 1.74 batters per 9.0IP at the MLB level and did not a allow a home run (0 homers last 36.0 IP dating back to last year)...Batters hit .217 (5/23) off him with RISP. Spent most of the season in Columbus, posting a mark of 11-8 with a 3.70 ERA in 24 starts (2CG, 143.1IP, 156H, 59ER, 23BB, 92SO)...He finished tied for first among International League pitcher in wins (11), tied for 8th in starts (24), 9th in innings pitched (143.1IP) and 11th in ERA...Finished T5th among organizational pitchers in wins and 6th in innings... Over his 10 second half starts he went 6-1 with a 2.72 ERA (59.2IP, 63H, 18ER, 9BB, 39SO)...Also finished tied for 2nd in complete games and tossed a CG/shutout on May 9 vs. Louisville (9.0IP, 4H, 1BB, 6SO, 97P)...Went at least 5.0IP in 21 of 24 starts for Columbus...Averaged 1.4 walks per 9.0 IP with the Clippers...Left-handed Triple-A hitters batted .250 (41-164) off him (.692 OPS) and right-handed batters hit .291 (115-395, .741 OPS)...His September 11 recall after Columbus's season ended was his third stint with Cleveland in 2016 (May 23-30; August 4)...Made his Major League debut on May 30 vs. Texas (0R, 4.1IP) in relief of Josh Tomlin...In September posted a 3.18 ERA in 2 games/1 start (5.2IP, 5H, 2R/ER)...Picked up first Major League win in first MLB start on Sept. 30 at KC (5.0IP, 3H, 1R/ER, 0BB, career-high 4K)...Did not walk a better or allow a home runs in his 11.0 Major League innings, limiting Major League batters to a .167 (6-36) average against...Earned his place in Tribe Postseason lore with a spot start in Game 5 of the American League Championship Series at Toronto on October 19, tossing 4.1 shutout innings while allowing just 2 hits/baserunners in the 3-0 series-clinching victory that gave the Indians their sixth American League pennant...Retired 12 of the 14 Blue Jays he faced and threw 49 pitches (33 strikes) in the effort...Rated by Baseball America as having the best control in the system entering 2017. Went a combined 12-7 with a 3.63 ERA (69ER/171.0IP) in 27 games/starts between AA Akron and AAA Columbus...Led all Indians MiLB pitchers in IP (171.0IP), was 4th in wins and 9th in ERA..Spent a majority of his season in Akron where he went 10-7 with a 3.51 ERA in 22 games and starts (141.0IP, 145H, 63R/55ER, 8HR, 8HB, 16BB/1 IBB, 89SO, .269AVG, 1.20WHIP)...Named the EL pitcher of the week for July 6-13 when he tossed a 7.0-inning no-hitter against Reading on July 11 (7.0IP, 0H, 0R, 1BB, 3K, 78P)... ERA in Akron over last 13 starts after June 1 was 3.18 (85.0IP/30ER)...He was promoted to Columbus on Aug. 15 where he finished 2-0 with a 4.20 ERA (14ER/30.0IP) in 5 starts...Went at least 5.0IP in all 27 starts on the year. Enjoyed a breakout season for the Mudcats in 2014, finishing the campaign with a Carolina League-best 13 victories while holding down a 2.58 ERA (46 ER/160.1 IP ) in a career-high 25 starts on his way to the Bob Feller Award as the organization's top Minor League pitcher ... Merritt's 160.1 innings led all CL hurlers, while his 2.58 ERA (3rd), 2 complete games (T 1st), 127 strikeouts (4th) and 0.95 WHIP (1st) all ranked in the top 5...Led organizational pitchers in ERA, was 2nd in wins, 3rd in innings and T 4th in strikeouts...Named an organizational all-star by MILB.com. The 6-foot, 170-pound southpaw limited opposing batters to a .216 (128-593) average against, including a .197 (23-117) clip against opposing lefties (walked only 4 left-handed batters all year in 123BF )... Merritt allowed just one earned runs across his first 4 starts (24.1 IP) of the season (0.37 ERA) and did not suffer his first loss until May 16...Allowed 2 or fewer runs in 6 of his final 8 starts, ending the season on a 4-game win streak...Allowed 2 runs less in 16 of his 25 starts, worked at least 5.0IP in all 25 outings (E RA in the 5th inning was 0.72, 2E R/25.0IP ) and at least 6.0IP in 19 of 25 starts ... Batters hit .236 (47-199) with runners on base and .234 (26-111) with RISP ... Went 2-0 with a 1.29 ERA... Added to 40-man roster on November 20...Listed by Baseball America as having the Best Control in the organization entering 2015. Used a strong second half that saw the lefty allow just 14 earned runs over his final 53.2 innings to finish the season with the 4th best ERA in the Indians Player Development System; was promoted to Carolina on 8/21 to make his final 2 starts of the campaign ... Walked just 18 batters while with the Captains which equated to the 2nd lowest walk rate (1.35) in the Midwest League … Was named Indians Minor League Player of the Week from 5/ 6-13. 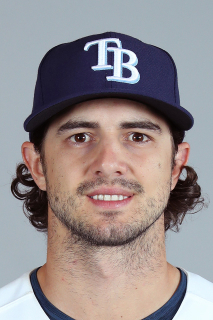 November 13, 2018 Tampa Bay Rays signed free agent LHP Ryan Merritt to a minor league contract and invited him to spring training. November 13, 2018 LHP Ryan Merritt assigned to Durham Bulls. November 2, 2018 LHP Ryan Merritt elected free agency. July 21, 2018 Cleveland Indians sent LHP Ryan Merritt outright to Columbus Clippers. July 13, 2018 Cleveland Indians designated LHP Ryan Merritt for assignment. June 14, 2018 Cleveland Indians sent LHP Ryan Merritt on a rehab assignment to Columbus Clippers. May 15, 2018 Cleveland Indians transferred LHP Ryan Merritt from the 10-day disabled list to the 60-day disabled list. Left knee sprain. May 4, 2018 Cleveland Indians sent LHP Ryan Merritt on a rehab assignment to Columbus Clippers. March 29, 2018 Cleveland Indians placed LHP Ryan Merritt on the 10-day disabled list retroactive to March 26, 2018. Left knee sprain. October 12, 2017 Cleveland Indians activated LHP Ryan Merritt. October 5, 2017 Cleveland Indians reassigned LHP Ryan Merritt to the minor leagues. August 30, 2017 Cleveland Indians recalled LHP Ryan Merritt from Columbus Clippers. August 26, 2017 Cleveland Indians optioned LHP Ryan Merritt to Columbus Clippers. August 25, 2017 Cleveland Indians recalled Ryan Merritt from Columbus Clippers. August 18, 2017 Cleveland Indians optioned LHP Ryan Merritt to Columbus Clippers. August 17, 2017 Cleveland Indians recalled Ryan Merritt from Columbus Clippers. July 22, 2017 Cleveland Indians optioned LHP Ryan Merritt to Columbus Clippers. July 17, 2017 Cleveland Indians recalled Ryan Merritt from Columbus Clippers. July 2, 2017 Cleveland Indians optioned LHP Ryan Merritt to Columbus Clippers. July 1, 2017 Cleveland Indians recalled Ryan Merritt from Columbus Clippers. June 17, 2017 Cleveland Indians recalled LHP Ryan Merritt from Columbus Clippers. June 17, 2017 Cleveland Indians optioned LHP Ryan Merritt to Columbus Clippers. June 13, 2017 LHP Ryan Merritt assigned to Columbus Clippers from Lake County Captains. June 12, 2017 LHP Ryan Merritt assigned to Lake County Captains from Columbus Clippers. March 20, 2017 Cleveland Indians optioned LHP Ryan Merritt to Columbus Clippers. October 14, 2016 Cleveland Indians activated LHP Ryan Merritt. October 6, 2016 Cleveland Indians reassigned LHP Ryan Merritt to the minor leagues. September 11, 2016 Cleveland Indians recalled LHP Ryan Merritt from Columbus Clippers. August 5, 2016 Cleveland Indians optioned LHP Ryan Merritt to Columbus Clippers. August 4, 2016 Cleveland Indians recalled Ryan Merritt from Columbus Clippers. July 6, 2016 Columbus Clippers activated LHP Ryan Merritt from the 7-day disabled list. June 27, 2016 Columbus Clippers placed LHP Ryan Merritt on the 7-day disabled list. Mid-back tightness. May 31, 2016 Cleveland Indians optioned LHP Ryan Merritt to Columbus Clippers. May 23, 2016 Cleveland Indians recalled Ryan Merritt from Columbus Clippers. March 14, 2016 Cleveland Indians optioned LHP Ryan Merritt to Columbus Clippers. October 5, 2015 Cleveland Indians recalled Ryan Merritt from Columbus Clippers. August 14, 2015 LHP Ryan Merritt assigned to Columbus Clippers from Akron RubberDucks. March 17, 2015 Cleveland Indians optioned LHP Ryan Merritt to Akron RubberDucks. November 20, 2014 Cleveland Indians selected the contract of Ryan Merritt from Lynchburg Hillcats. August 20, 2013 Ryan Merritt assigned to Carolina Mudcats from Lake County Captains. March 31, 2013 Ryan Merritt assigned to Lake County Captains from Mahoning Valley Scrappers. June 16, 2012 Ryan Merritt assigned to Mahoning Valley Scrappers from AZL Indians. August 15, 2011 Ryan Merritt assigned to AZL Indians from Cleveland Indians. August 14, 2011 Cleveland Indians signed LHP Ryan Merritt.